Our White Melt and Pour Soap Base is a detergent free soap base that is opaque and white in color. The twenty-four pound big block is ideal for larger projects, as it will make (96) 4 oz. bars of soap. Soap comes in a blue bag with twist tie and corrugate box. A single block measures 13 x 11.5 x 6 inches. COMMENTS: Love this soap; as I do all the others I've tried! I highly recommend! "Crafters choice Detergent Free White MP Soap Base "
COMMENTS: Great addition to my soap store. Excellent texture, easy to use and arrives very quickly for shipment. Would recommend this base soap. "Husbands loves the way it makes him feel"
COMMENTS: I love this soap base. Easy to work with and has a nice lather, especially for a detergent-free soap base. COMMENTS: I love working with Crafters Choice Detergent Free MP Soaps- they are the best on the market!! COMMENTS: I really love this base, i find it to be even more moisturizing than the three butter base. I get a really rich lather, my fragrances hold well! COMMENTS: I am new to MP soaping and decided to go with detergent-free bases since I'm not a fan of SLS. This soap is a crisp white and is great to color. I use it for my basic bars and embeds where I don't really need the benefits of additional ingredients (goats milk, shea butter, etc.). 24 pounds doesn't seem that heavy but it's a pretty big slab of soap. It was fun hacking my way through it to make more manageable pieces. Right now I'm keeping about 3#'s in a rubbermaid container but I'm sure I'll have to upgrade as I make more soap. The possibilities are endless! COMMENTS: Worked great. Has a little odor when unscented, but adding scent totally masks it. COMMENTS: This MP allows me to add other ingredients like goats milk etc. I like the idea of detergent free. COMMENTS: love the lather and feel from this base. I use it often! COMMENTS: I like the detergent free option. It's very good quality. It takes color and EO/FO easily. It hardens nicely and I've had no problems with it sweating. Good soap. "A great product to create personal soaps"
COMMENTS: A great product to create personal soaps with various fragrances. "Love the Detergent free white melt and pour soap"
COMMENTS: Love this soap! Use it for all of my melt and pour projects. Ease of use makes this a #1 choice. COMMENTS: I love that I can buy a big block and make large batches. COMMENTS: I use this soap base when I'm feeling ultra creative. I can add so many different things to this soap base to create a unique to me soap for my customers. COMMENTS: Good quality soap base...best of all it's detergent free! COMMENTS: If you are looking for a good starting base this is the one!! COMMENTS: The detergent free soaps are the only ones I will use. This variety is easy to use, takes color and scent well, and has a great creamy lather. "Great base for sugar scrubs and bars"
COMMENTS: I use this base for my sugar scrubs and for almost every type of bar. It suds well and is moisturizing. COMMENTS: This soap melts very quickly and leaves little residue on the sides of my pots. Holds up well in hotter outdoor settings such as farmers markets (I live in Houston). Low to no sweat. COMMENTS: Great product and price! Customers tell us all the time on how moisturizing this soap is. The 24 lbs blocks can easily be cut with a pizza knife. COMMENTS: Nice white color to use alone or with color to make a pretty pastel. Customers love that it is detergent free. COMMENTS: Buying this product on 24 lb instead of smaller sizes is great and economical. It took me a while to figure out how to cut it but after that it was easy. Great lather and color. COMMENTS: A very good product and can be used to make any soap,color and scent. COMMENTS: I love this soap almost as much as my customers do lol! It is easy to work with. It holds scent really well and mixes easily with colorants. I have yet to have a bar sweat on me! My customers say that it makes there skin feel so amazingly soft and they just love using it daily! Great buy and will buy again! "Great soap base! Highly recommend." COMMENTS: This is a great soap base. Very minimal shrinkage and it unmolds very easily. Holds scent well and its a very nice lathering bar. Highly recommend it. COMMENTS: I like this base a lot. It's easy to use, melts and colors well. I will buy this again. COMMENTS: I love the fact that this is detergent free. Low Sweat! Performs wonderfully! COMMENTS: We use this for the kids and adults that just want a nice bar of soap. We use it for embeds & when layering in white. Nice lather, gentle on skin, and many uses that it has without using the "good" stuff, (goat milk, BBM, 3B), love that it is detergent free. We will be switching to all DF Bases! COMMENTS: Easy to melt and pour into molds. I used silicone and plastic molds for soap making. Great for holding scents and color. COMMENTS: I was pleasantly surprised at the amount of lather this base has. It is a nice hard base as well. • hardness makes it harder to cut. COMMENTS: this is my go-to white base. its hard but not too hard and is easy to embed in clear soap. COMMENTS: Got during a red white and blue sale. Cant wait to get more! COMMENTS: Very easy to use, great quality, versatile product. COMMENTS: I have been very pleased with this detergent free soap. "Detergent free" is also a great selling point. The soap is a beautiful white color and suds up nicely. "Great for cutting soaps that are softer"
COMMENTS: While I like the Buttermilk soap, it takes a long time to cure and is a bit too soft for my taste, so I cut it with 1/4 Dteergent Free White Soap. These bars set up in the same time, but cure in half the time, and are harder. As a professional, I appreciate this. "Nice simple m&p soap base!" COMMENTS: I usually make CP and HP soaps but I use this M&P soap base for one of the products I sell in my Etsy shop. When I buy this base in the large 24 lb block, it really helps with my profit margins. The soap is nice, lathers well, and blends great with many FOs. I only wished the 24lb block came with a chainsaw...cutting this beast takes alot of energy. COMMENTS: A must for soap crafters who have customers with sensitive skin. Holds color & fragrances very well. Even though I live in a very high humidity area, soap does not sweat. "I love this soap base!" COMMENTS: I ended up buying more quantity of this base after starting out with a couple 2pound trays first. I love it and it is easy to work with. It takes color well and looks great after it hardens. COMMENTS: I have been using this soap base for a few years now and it always has great results. The only issue I have is getting the 24 lb. block cut down into usable sized pieces. A good work out for my arms. COMMENTS: The detergent free white is a very nice economical soap base! It produces lots of lather too. It is not the whitest of whites, but it is perfect for the price! COMMENTS: This soap base is easy to work with, but hard to cut the big block. It's worth every minute, though. I wish it suspended additives such as pumice, herbs, etc. a little better. COMMENTS: This is the soap I use in about 95% of my soaps. Great product. Easy to demold. Nice white color. No smell. COMMENTS: I use this for all of my M&P projects!!! Great stuff!!!! COMMENTS: This is a great base. I use it for my specialty soaps that I make. I have had no complaints. I will continue to use this base until it is no longer available. COMMENTS: This M&P base is the best on the market.I was so impressed with the moisturizing properties of this soap. This is the only bulk I will buy from now on. "Love that it doesn't sweat"
COMMENTS: I love this soap how it doesn't "sweat" after making my soaps. 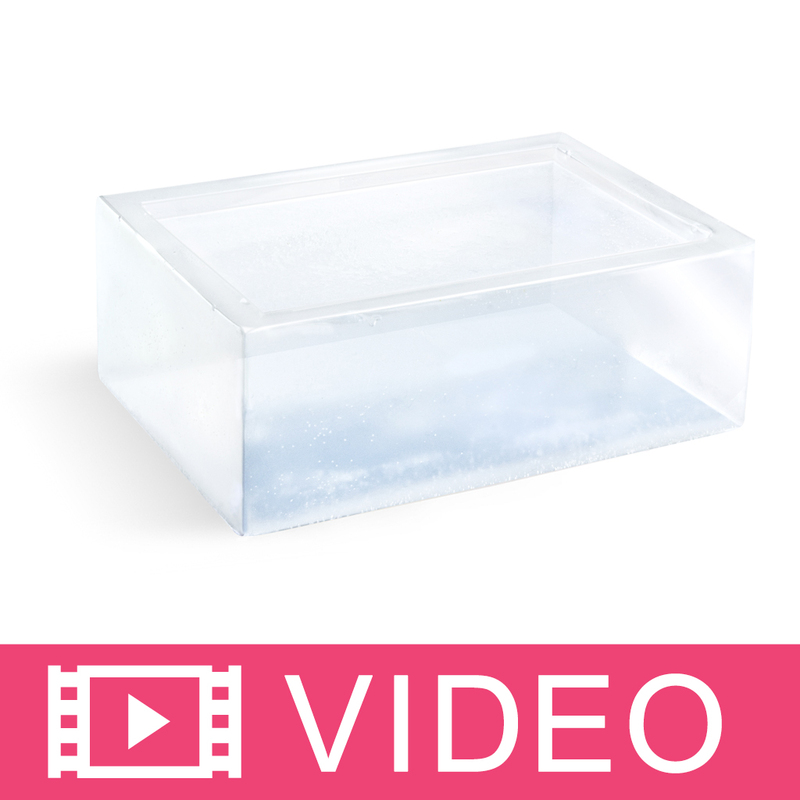 COMMENTS: This is the base that I use for my melt and pour soap. It is easy to work with and affordable. "Great Soap - Low Sweat"
COMMENTS: I have tried several soaps that say they are low sweat, but being from the humid south, I usually prove them wrong. I have had the least amount of sweating issues with this soap. I get a little, but I don't think it's possible to completely avoid some sweat when you live in an area where you can cut the air! Holds scent well. Un molds well. It has some shrinkage, but I actually think that adds to the beauty of the bars I make. "It doesn't get any better"
COMMENTS: The very best from WSP to date! COMMENTS: Besides it being very slippery and difficult to cut, I enjoy the finished product. "Love this Low Sweat and Detergent Free Soap"
COMMENTS: Just love this base. I live in a Very Hot and Humid Climate and this base does just what it claims! No Sweating! Ive tried & been disappointed by many bases and this one performs perfect in my area weather. When left unwrapped, it does 'cure' and shrinks a teeny-tiny bit, just as cold process soap. Has a nice creamy lather with small to medium bubbles. Holds scent and color well. I DO use a color stabilizer. I cant say enough good things about it. COMMENTS: My customers prefer a more detergent free option and this is one of my customers favorites. It accepts color well and holds fragrance. I will keep purchasing this soap for sure. COMMENTS: After some doubts, we are truly appreciative of this formulation. Thank you WSP! "Excellent melt & pour base"
COMMENTS: I use this base for all of my white soaps, love that it is detergent free - that is a huge selling point. I use this to make my own laundry soap as well & works just as good as the more expensive castile soap, but is much more inexpensive. COMMENTS: Love! Love! Love! Everything about this soap base is perfect.
" I actually need to know how much MP soap is needed for 200 3oz wedding favors and also how much fragrance oil would I need. Thank you :)"
Staff Answer You would need 600 oz. of soap. This would be 37.5 lbs. of soap. If adding fragrance at 3%, you would need 18 oz. of fragrance oil or 0.09 oz. per bar. "I used this in a loaf mold (7cm x 5.5cm x 25cm) and unmolded it after 2 days unwrapped. The result soap was too soft, almost mushy and cannot be used. Is this supposed to happen? How long should I cure this for? I live in a place where its 70-80% humid and it has been raining almost every day, so I'm not sure if humidity could have caused it too. " Staff Answer Humidity can absolutely have a factor in hardening your soap. The Detergent Free bases are naturally softer than the ones containing detergents. The soap will harden as it sits. If you are able to put into an air conditioned room, or in front of a fan, this might help. It may take up to a week or so to fully "cure". "Hi, What is the best colorant to get this white base a pretty, vibrant Christmas red and also green? Also, if its a liquid colorant, how much would I use per 9.45 ounces? I’m using five of the Milky Way Peppermint Cane Molds (each holds 9.45 oz) and the Peppermint stick fragrance oil. I’m making 100 of these soaps. Thank you very much." Staff Answer You would not be able to get vibrant colors using a white soap base. You would need to use a clear base for a bright red and green color. We recommend using non-bleeding colors and the amount to add is entirely up to you depending on the shade you want. "Where is the Stearic Acid sourced from, Animal or plant? " Staff Answer The stearic acid is plant based. "Is this base gluten and dairy free?" Staff Answer There is no gluten or dairy in this soap base. "Is this ok to use for washing a dog?" Staff Answer This is a mild soap without added detergents so it should be fine to use on a dog.
" I was just wondering if the glycerin is plant based. " Staff Answer Hi Leeana, the glycerin used in our products in vegetable-based. "Isn’t there a video to show how to easily cut the 24lb block. " Staff Answer Hi Lisa, we do not have a video to demonstrate how to cut a block but we do have the Removing Blocks From Package video. Hope this helps! "What are the statistics of this product in terms of naturally derived ingredients? Thank you. " Staff Answer The formula ingredient percentages are proprietary. This product is not natural, nor do we claim that it is. The ingredient listing is located on the 'Ingredients' tab of the product. If you would like to see in detail what these ingredients are, I would suggest an internet search on each one. "Can this base be considered glycerin soap?" Staff Answer Yes, looking at the ingredients of the soap, it does contain glycerin. "Are any Crafter's Choice products tested on animals?"